Awarded the maximum 5 Star and 3 year licence under the new animal welfare regulations Grinning Gecko has established a reputation of excellence in regards to animal welfare and customer service. Grinning Gecko offers for sale a wide selection of reptile enclosures, equipment and accessories along with top quality live and frozen food. In fact, we stock or can swiftly obtain virtually anything required to give your pet reptile the best possible home,environment and diet. At Grinning Gecko we also stock a fantastic selection of top quality reptiles. All of the reptiles sold at Grinning Gecko are captive bred either by ourselves or breeders / suppliers who share our ethical considerations and commitment to animal welfare. 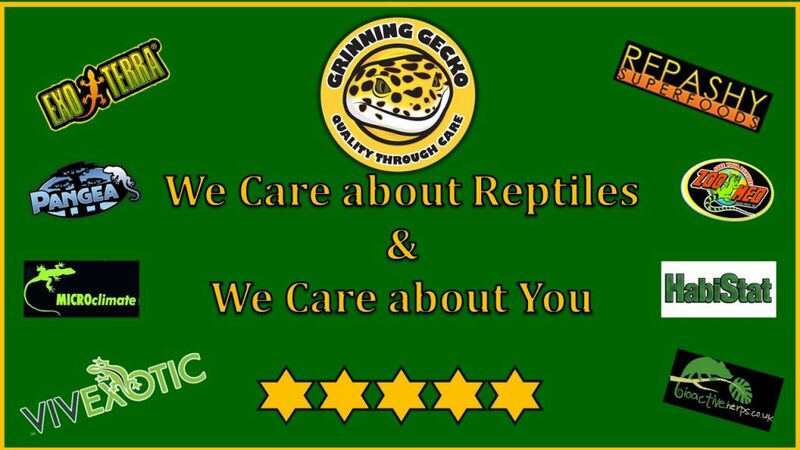 At Grinning Gecko we care about reptile and we care about you. We will only sell animals that we genuinely believe are in fullness of health. Grinning Gecko does NOT and will NOT sell wild caught reptiles. We are committed to helping the new or less experienced reptile keeper. If you are looking to own your first pet reptile Grinning Gecko will help you with every step of the way. Our pledge of help and support continues long after you purchase your pet from us. Stockists of VivExotic & ExoTerra Enclosures and Accessories. Lighting, Heating, Environmental Control, Monitoring, all Reptile Related Equipment and Accessories. Fantastic Range of Decor, Hides, Dishes, Artificial and Live Foliage available in Store. If we do not have the product you require in stock we can normally obtain it within 24 hours.